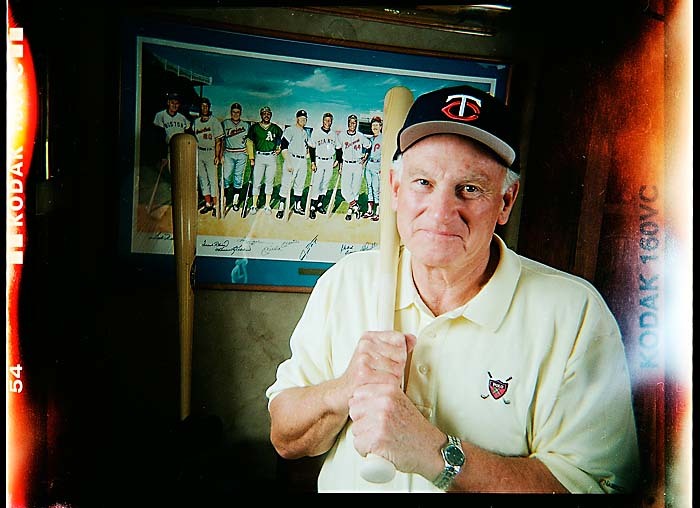 I had the privilege of photographing Harmon Killebrew in 2002 in his home in Scottsdale, AZ. He was a genuinely nice guy who gave me as much time as I needed, and chatted about everything from the weather to his time with the Minnesota Twins. I’m not much of a sports guy (I didn’t tell him that), but what little attention I paid to baseball as a child was because of Killebrew. My family is originally from Minnesota but we never really lived there. My grandparents though lived in St. Paul up until the time they died and visiting them during summers meant hours of watching the Twins on grainy black and white TV’s, either on the back porch or in the basement. After leaving the Twins he played with the Kansas City Royals for one season before retiring from baseball. Inducted into the Hall of Fame in 1984. And none of these records have asterisks behind them. There was never a hint of scandal or cheating with Killebrew. The world learned that Killebrew had entered the final innings of his life late last week when he went into hospice care for esophageal cancer. He passed away this morning. For a lot of Minnesotans of a certain age, it’s the passing of an icon.